I love this salad. 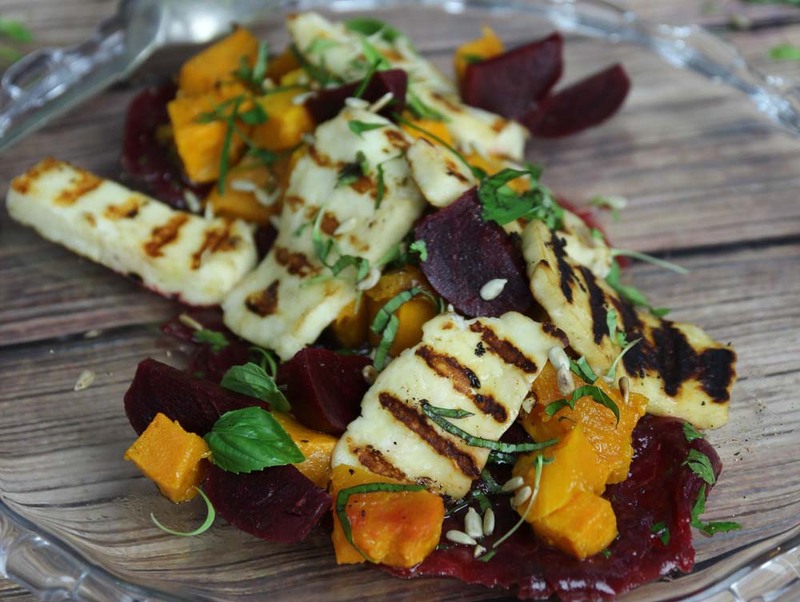 It has everything you need Golden roasted Pumpkin, Beetroot and glorious crunchy warm Haloumi. Perfect for a side dish or as a whole dinner! It’s April and I can’t let go of summer. It happens every year about this time. I go along thinking it will stay warm, hoping it will stay warm, and then one morning it happens, I wake up and it’s cold. There’s frost on the car and I have to find different clothes to wear to work. Until Easter, when I know it will be winter soon, I try to find all the summer things that cheer me up, like salad. One of the lovely things that happened to me this summer was going away for a short break with one of my sisters. We went on a road trip to visit our older sister. We didn’t do anything too special if you don’t count just being together talking laughing , cooking and going out for lunch. The memory of this will carry me through the long months of winter. We went to a great cafe in Port Macquarie in northern NSW and had a salad similar to the one I have made today. This is what I have In My Kitchen. All of the ingredients are easy to get if you want this warm salad in your kitchen this April. There is nothing better than freshly roasted beetroot. Give it a scrub and cut into quarters toss in olive oil and salt and pepper and roast on a baking tray or wrap in foil if you prefer. If you dont quite have the time for this then this pre-cooked beetroot can be very handy. Just be sure to flavour it up well with a delicious dressing. I love slicing it into fine carpaccio and serving with chicken or lamb too. 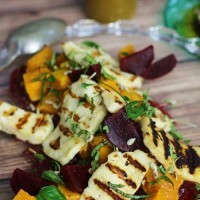 Haloumi is a great way to bring warmth to your April salad. Slice it and grill on the BBQ or on a grill plate on the stove. A good salad dressing is always a must. Just remember your salad dressing will be as good as the oil and vinegar you use. Skip the supermarket and spend a bit of money on a really lovely vinegar a deli or specialist food store will have what you need. It could be a red or white wine vinegar a nice apple or sherry vinegar or a white balsamic condiment. You will not regret the difference it makes. Keep it in the fridge once opened to stop it oxidizing and it will stay fresh and sweeter tasting much longer. I have made this dressing with a white wine vinegar that has a lot of natural sweetness. 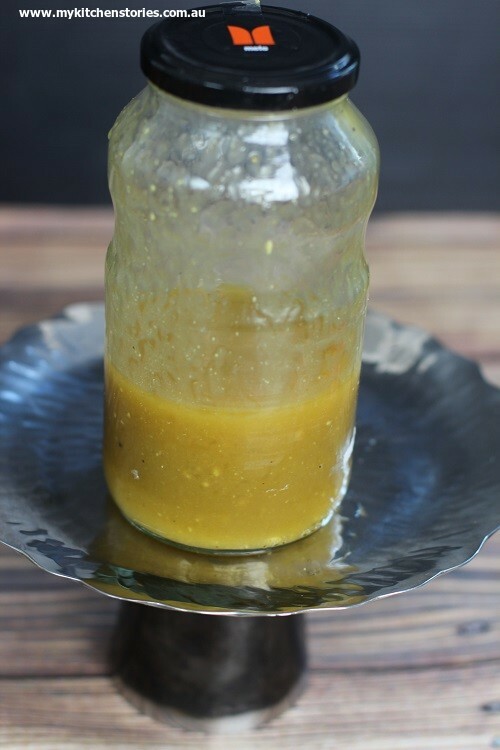 The dressing recipe is easy and you can tweak it to suit the vinegar you use. Find a jam or sauce jar, shake it up and keep the left over in the fridge for next time. Finally you will need some sweet pumpkin. Pumpkin should be more affordable now. Serve it warm from the oven or roast it the day before. What ever works for you. Do you want to see what’s happening in kitchens around the country and the world ? Well have a look on Celia’s blog. www.figjamandlimecordial.com. AND don’t forget to make my goodbye to summer salad. A lovely simple warm salad that is great in summer and winter too. Make the salad dressing by putting the dijon,honey, vinegar, olive oil, salt and pepper into a jar and shaking. Make sure the balance of sugar and salt is right. Dressing should taste great even before you add the salad! 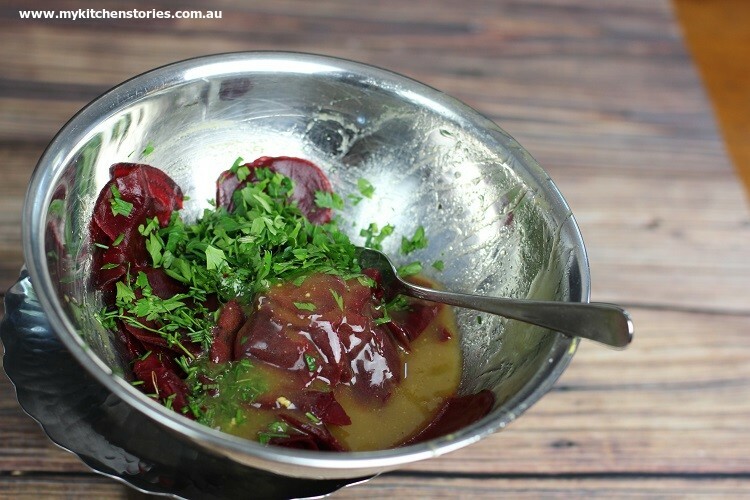 Cut the beetroot in which ever way you prefer and put into a bowl with the chopped chives and parsley a sprinkle of salt and 2-3 tablespoons of dressing and mix well. Sit for a couple of minutes. 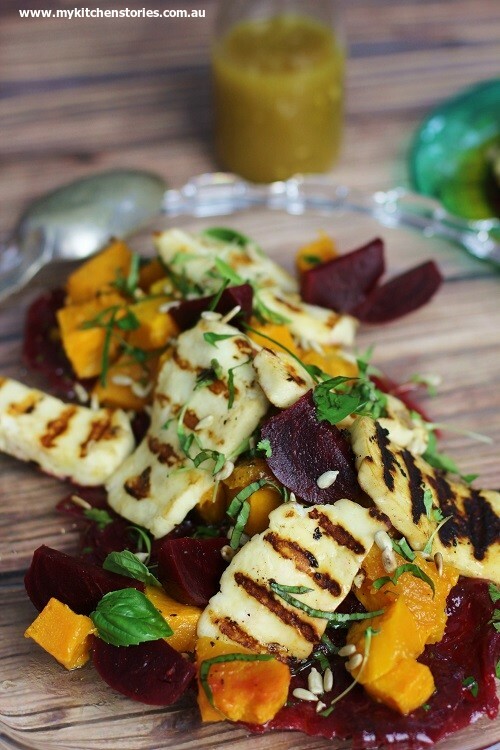 Set aside while you grill the haloumi. Heat a grill pan to very hot. Roll each piece of haloumi in a tiny bit of olive oil before grilling for a couple of minutes on each side or till just coloured golden. Place onto the salad plate or bowl and drizzle with more dressing. I love that pre- cooked beetroot in packs: it is so handy. G’day! Your salad looks delish Tania, true! 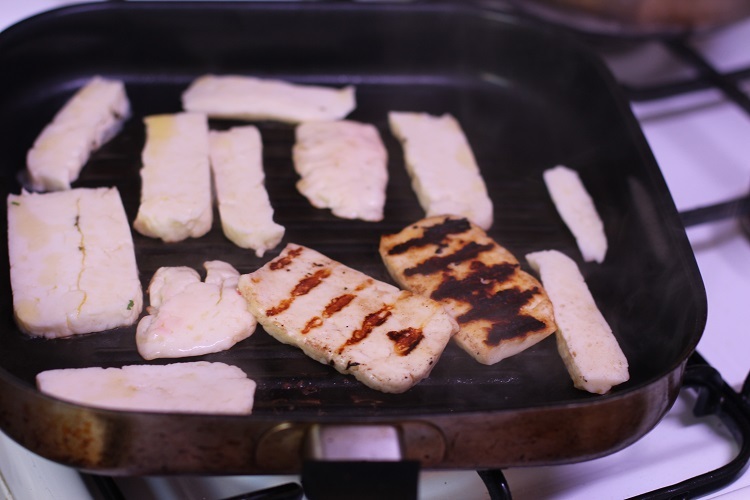 I have never grill haloumi before but it is on my list to do! A wonderful winter salad, Tania. Love the combination of flavours….so healthy and delicious. I’d swap the haloumi for tofu (which it actually looks a bit like with the grill marks 🙂 ) and be very, very happy with this dish. Thanks for linking it up to IMK – it’s just the thing for changing seasons (although I’m quite happy with cooler weather, I will miss summer food!). I feel like this salad is kind of a mix of summer and fall! I love the roasted veggies and haloumi paired together. A great sweet and salty mix. As I am wishing for warm weather, you are trying to hold on to it. Your salad looks great…I’m going to see is I can find haloumi cheese. I know exactly what you mean about not letting go of summer. Here, we’re desperately trying to grab summer! My beetroot are only seedlings at the moment, but I’m going to try this as soon as they’re big enough. Sorry Tania but I’m just not ready to say goodbye yet! I LOVE this salad and I want it in my kitchen by noon tomorrow. Beetroot and I are best friends forever. I can’t wait to say goodbye to winter finally. I don’t blame you being in denial at it’s approach. Lovely salad though – screams of sun, heat and summer. Job done! I hope your autumn and winter aren’t too harsh. Letting go of the warm weather was always a big challenge for me. Your salad looks incredible, Tania! I am so over summer and so ready to say goodbye to it. I am loving the cooler weather that we are finally getting. I do love beetroot in a salad. Pairing it with haloumi is genius. I am glad to see the vacuum packs of beetroot starting to appear so we aren’t just stuck with the canned pickled variety. Beautiful salad. I love the colours. 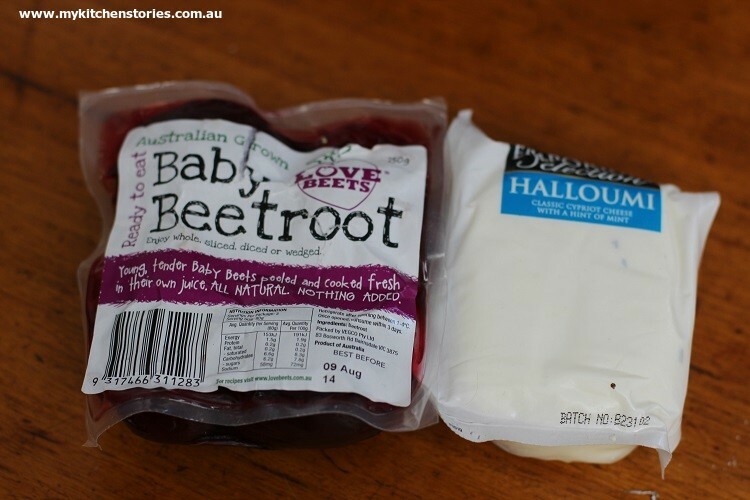 I have that exact packet of beetroot in my fridge…now for the haloumi! I’m very fussy about my haloumi and usually only buy Olympus brand, made locally in Brisbane. Having said that, just this past weekend I bought some of the haloumi in your picture (I recognise the packaging) and have to say, it’s pretty good. Not quite up to the local Cypriot’s standard but a lot easier to source! Thanks for the recipe – may this is one to try over Easter. YUM! I love beetroot and matching with haloumi is one of my favourite ways of eating it. 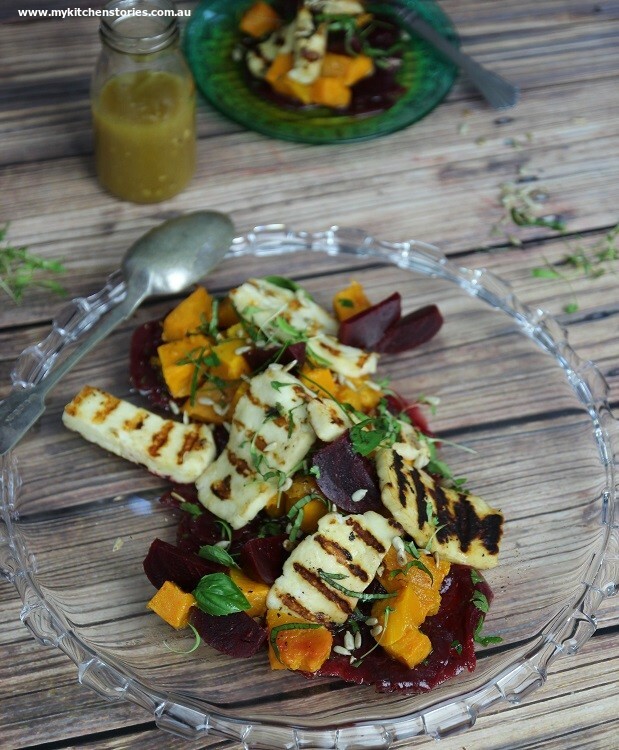 Actually, I love haloumi on any salad 🙂 If you are looking for a good vinegar, try the Lirah vinegars – some of my favourites.